"Healthy alternative if you want some dessert. Good to make night before if using it as a dessert or breakfast item." Combine apple juice, quinoa, and vanilla extract in a large pot; bring to a boil. Reduce heat to medium-low, cover, and simmer until quinoa is tender and liquid is absorbed, about 15 minutes. 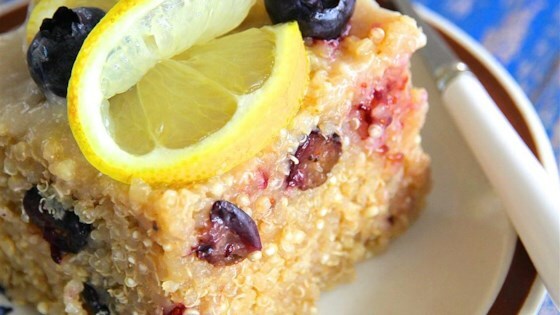 Gently fold blueberries into hot quinoa. Pour blueberry mixture into a 9x13-inch baking dish. Cool until quinoa is set. Whisk almond milk, water, and cornstarch together in a small saucepan over high heat. Add lemon juice and maple syrup; cook, stirring constantly, until glaze is thick, 2 to 3 minutes. Pour hot glaze over quinoa to cover it completely. Cool to room temperature. Cover baking dish with plastic wrap and refrigerate for at least 2 hours. You can substitute 1 tablespoon kuzu chunks for the cornstarch. The amount f lemon juice was very subjective. Listing one lemon juiced doesn't tell you how big of lemon (come in all sizes) or how much juice is really needed. Not much flavor in the topping. very bland flavor..what a waste for 2 expensive ingredients,,very disappointed.